Guest Post by SkilledUp‘s Nick Gidwani. ScraperWiki is a revolutionary tool. Not just because it allows you to collect data, but because it allows anyone – including journalists who now must specialize in data – to organize and draw conclusions from vast data sets. That skill set (organizing what is now called “big data”) was not something that was expected of journalists just a few years ago. Now, in our infographic and data-hungry new world, being versed in analysis is critical. Knowledge work – the type of work that requires creativity, problem solving and “thinking” – is the most important and valued work of the future. Increasingly, to become a knowledge worker, one must learn a varied set of skills rather than just be a master of your own domain. We are already seeing “Growth Hackers” become an increasingly valued position, where individuals with comfort and expertise with data, analysis, marketing and product development can combine those skills to do what was once the job of several people. It is a rarity these days to find a writer that doesn’t have at least proficiency in social media concepts, optimizing for SEO or editing an image in Photoshop. Few graduates of universities arrive on the job with any of these hard skills – the ability to immediately contribute. For those starting off at a Fortune 100 company, there is a good chance that they have an internal training system to help you get started and trained to use the newest tools. For everyone else though, you are expected to learn it on your own: not an easy proposition, especially in today’s very competitive labour market. Well, the good news is that there is an army of experts, startup CEOs, and others that have run companies, mentored and trained employees, and had success in business, that are willing to share their skills – the how, the why, and the what – via online learning to large audiences. Even better, much of this content is free or available at a very low cost, and widely available. Although companies like lynda.com have been around for a while, we’ve seen exponential growth in the variety and number of online courses being introduced in the last 18 months. 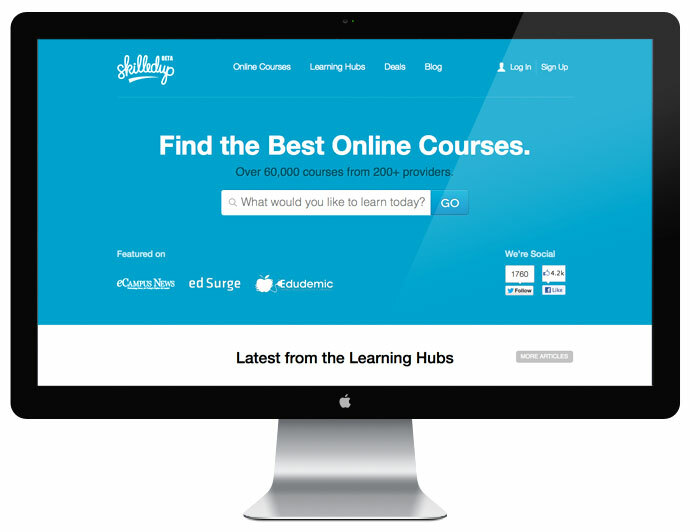 New, easy to use tools that allow you to create online courses have also enabled the creation of courses. Different from the university model, this educational content is highly fragmented, rarely features certification, and is priced all over the map. SkilledUp‘s goal is to organize, curate and review the world of online education, with a focus on the type of education that imparts marketable job skills. We believe that in this new world, many of the best workers are going to be those who teach themselves these skills by first learning from experts, and then trying their hand by experimenting in their jobs or on their own. While there is a lot of great training from excellent instructors, much of it is prohibitively expensive or too lengthy to apply quickly. We hope to make it easier to separate the best from the rest. We’ve begun by creating our online course search app, which is currently organizing 50,000 courses from over 200 unique libraries. We expect these numbers to continuously grow, especially in areas like MOOCs (Massive Open Online Courses), Talks (things like TED.com or Poptech.com) and even E-books. We understand that everyone learns differently, and while some may prefer a 12-hour course with video, others prefer a high quality e-book, perhaps with exercise files. Over time, we expect to add signal data to these courses, so that parsing the ‘best’ from the ‘rest’ is easier than reading a review. To create something that is truly comprehensive and robust, we are asking the ScraperWiki community for help: more course libraries needs gathering, sorting and adding to our database, especially of the open (aka free) variety. We’re looking for people who can scrape sites, make suggestions, or suggest learning libraries they know about so that we can build the most robust and useful index possible. Nick Gidwani uses ScraperWiki as part of his startup company: SkilledUp.